Your baby may be vomiting for a number of different reasons, usually very minor. The most common are listed below. If your baby has drunk too much milk, it may cause her to vomit. She may just bring up the surplus milk, but sometimes the whole feed may come up. If this is the case she will probably only vomit once after the feed. Indigestion can cause your baby to vomit, so try not to rush her feeds. Occasionally babies can have an allergy to the proteins in their mother’s breast milk and this may cause her to vomit. Consult your doctor if you suspect this is the case. You may be advised to change your diet or give your baby a hypoallergenic formula for a while. Gastroenteritis or stomach and intestines, is a common cause of infant vomiting. Usually accompanied by diarrhea, there may also be fever and a loss of appetite. If symptoms persist for more than six hours, consult your doctor. A fit of coughing can sometimes make your baby vomit, the force of the coughing causing her stomach to bring up her feed. If this is the case she will probably only vomit a few times, but if she keep vomiting, get in touch with your doctor. Other illnesses that can be accompanied by vomiting include: urinary tract infections, ear infections, meningitis, appendicitis, pneumonia and Reye’s syndrome. An upset tummy due to something your baby has eaten can cause her to vomit, and will most likely be accompanied by diarrhea, loss of appetite, general irritability and occasionally fever. This should not last for long, but if the symptoms do persist for more than six hours, then consult your doctor. Excessive crying may sometimes cause your baby to vomit as she takes in gulps of air. If your baby has a very runny nose and swallows a lot of mucus, it can cause her to vomit. Treat her symptoms as you would a common cold. If your child vomits for more than six hours, consult a doctor. If diarrhea, fever, earache or a severe rash accompanies vomiting, seek medical help. Offer your baby small but frequent amounts about 2-3 teaspoonfuls of oral electrolyte solution every 15-20 minutes. This contains salt and sugar and replaces important nutrients her body relies on but which it may have lost due to a bout of vomiting. Always read the instructions of the solution carefully and give the right dose for the age of your baby. This will help to stop your child becoming dehydrated. If your child goes for eight hours without vomiting, gradually re-introduce her normal formula feeds, offering her little and often to give her tummy the chance to get used to feeding again. For breastfeeding infants, if the sickness seems to cease, breastfeed your child for five minutes every two hours. If, over an eight-hour period, she manages to keep her feed down, you can resume her normal routine. As with infants under six months, offer your baby small but frequent amounts (about 2-3 teaspoonfuls) of oral electrolyte solution every 15-20 minutes to prevent her becoming dehydrated. After eight hours of no vomiting, you can re-introduce formula feeds slowly, not giving your child too much at a time. Offer feeds of 30 – 60ml, gradually working up to the normal feeding routine. 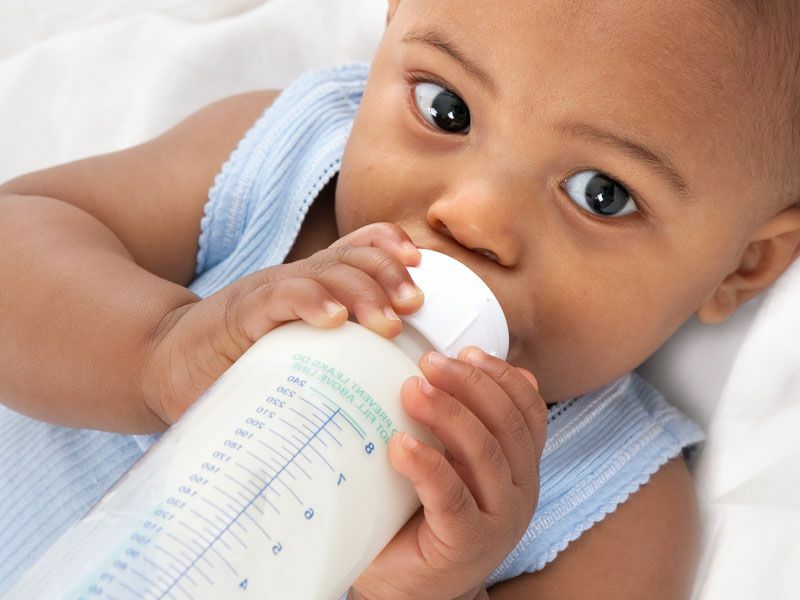 For breastfed infants, follow the advice given for babies of under six months. After eight hours, you can try to give your baby small amounts of bland foods such as bananas or mild baby food. Give clear liquids such as water, but dilute fruit juice and avoid giving milk. As with younger babies, give your child oral electrolyte solution to help replace lost salt and sugars, carefully following the instructions on the packet. If your child vomits up the solution, start again with small teaspoonfuls. After eight hours of no vomiting, try giving your child bland, soft, easy foods such as soup, toast (with no butter) and banana. If after 24 hours your child is no longer vomiting, she can resume her normal diet.